This Durango piece comes from Tess Rose Lampert, mezcal educator and frequent Mezcalistas collaborator. She has organized our DC and NYC Mexico in a Bottle in-event programs and will be spearheading our upcoming Chicago in-event program. We are looking forward to more posts from Tess in the future. Also be sure to check out her interview on Hey Hey Agave as she talks more about her Durango adventures. 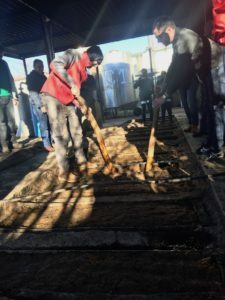 In January 2019 the newly formed Espiritus De Durango conglomerate invited members of the professional agave community to come explore their mezcal terrain and community for the first time. Handpicked by agave distillate guru of SACRED Agave, Lou Bank, a mini bus full of us arrived with open ended expectations. 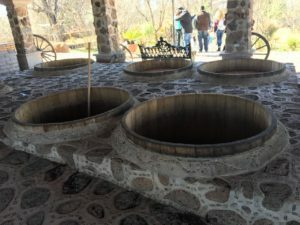 The curated experiences of the following 5 days offered a cross section of the rapidly evolving mezcal industry in Durango. There was everything from well funded luxury projects, semi industrial production, and medium sized brands to the most rustic operations in remote valleys. Our reception was nothing short of extraordinary, in the private home of the Sarabia family, who along with the well know Cortes Family from Oaxaca (Casa Cortes, Nuestra Soledad, El Jolgorio), produce Espiritus De Durango. Mezcal was free flowing as we enjoyed our first tastes of local delicacies like bean stew and Durango style chicharron. Even under the cover of night the terrain was impressive in its expanse. Our first stop was in Nombre De Dios, a pueblo magico from which many producers source their agaves, and where we got to experience the landscape up close and personal. The terrain was full of small, medium, and large formations of volcanic rock, which is particularly good at retaining heat when used in the hornos for cooking pinas. Dotted with huge nopales and agaves, it can feel desert-like in the dryer months, but is lush and green with a flowing waterfall other times of year. From there we visited Cuero Viejo Mezcal, where the vinata (what a palenque is called in Durango) is part of a larger visitor area that will feature luxury villas, an extensive wellness spa, and a restaurant on the large ranch. The details of each element are exquisite, especially the food that may have been the best from the entire trip; the mix of carnitas and gorditas prompted Phil Ward, NYC based pioneer of agave cocktails, to admit that sometimes he feels like mezcal trips are an excuse to get to the food! The mezcal team here is a combination of strong family ties to the Sarabia family, who make mezcal in a Oaxacan style (more on that later), and locals who come from generations of vinateros (palenqueros or mezcaleros). 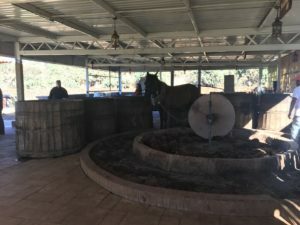 By having their vinata nestled in the property, Cuero Viejo is actively integrating knowledge and appreciation for mezcal into the larger tourist destination, featuring the vinata as a key point of interest for visitors. Working with Cenizo durangensis, they produce a few mezcals of varying degrees of alcohol from 38-52%, including one that is triple distilled. Especially encouraging was how open everyone from the Cuero Viejo team was to constructive feedback from our opinionated and straight forward group. At the helm of the brand is CEO Martha Garza, who is currently revamping the label and logo for international appeal, and working towards finding the signature style that represents and promotes their deep love of the local culture. Winding our way through impossibly dense nopales, yucas, and agaves the bumpy road eventually took us to the secluded and lovely vinata El Ojo where Origen Raiz is produced from Cenizo durangensis. As a collaboration between Casa Cortes and Back Bar Project, the mezcal has been instrumental in allowing people outside of Durango to experience mezcal from the region. One important aspect to note is the cross cultural production that is very much a combination of two traditions. For example, in Durango the cooked piñas are traditionally crushed by hand, or by machine when possible; there is no tradition of using a tahona, which is technology that came over with Europeans and was largely adopted in the southern parts of Mexico and not as much in the north. At El Ojo the cooked pinas are crushed using a tahona according to Oaxacan tradition, and aside from their friends at Cuero Viejo, no one else in Durango uses a tahona. This marriage of styles and cooperation between distinct regions is an exciting evolution of the mezcal world that is just starting to be possible. In many ways this mezcal is a bridge from the comfort zone of Oaxaca, for consumers and trade alike, to the new and rewarding world of Durango. As we drove off in the dusk the vistas became even more breathtaking, painted like a silhouette against the sunset with an occasional quiote rising above the landscape. Still within the Nombre De Dios municipality we started our next day at Sacro Imperio. With family heritage that stretches back for generations they are just starting to consider international appeal. With intuition rooted in heritage, their process reflects the local traditions. With inquisitive agave lovers like Jay Schroeder in tow, the group picked up on a stainless steel still in the vinata and asked about it directly. It turns out this particular steel still head had been given to them to use as part of a sponsorship deal, but they had never used it. Their mostly cenizo based mezcales were also served at a variety of alcohol levels and sometimes 3 distillations. After a mariachi brunch on the patio we got into some smaller experimental bottlings, like their Verde, which was one of the best things I tasted on the entire trip. We were all eager to tour the semi industrial production facility behind the brand 618. Everyone got to see up close and personal the machinery and what it was doing at each step of the way. The transparency was not lost on our group. Agaves are cooked in an autoclave and then loaded into the mouth of a chipper which turns out the agave bits onto a conveyor belt, and passes through a few rows of water jets that extract. Juice from the pressed agave fibers flows into fermentation tanks through a system of stainless steel pipes. Their aim is to create a mezcal that is easy to drink, aimed at novice mezcal drinkers in clubs and bars. Without going too deeply down the rabbit hole, there is a demand for this style of mezcal, and it’s nice to see transparency from the company making it. 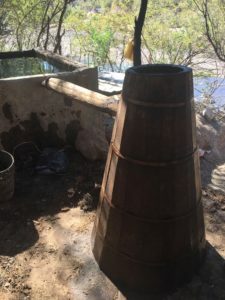 Their property also includes a smaller vinata out back, which will be used to make mezcal artesanal sometime in the future. Behind that is an impressive nursery of cenizo, including a greenhouse and patches with plants at various stages of growth. They are investigating the biodiversity of the variety while replenishing and planning for the growth of the industry. Branching out to a different region we visited Apaluz, a remote and rustic mountain vinata in Nicolas Romero. The trek to Nicolas Romero literally broke the mini bus the board of tourism had allotted us; (when we got back we rented SUV’s which came with a bottle of a private label mezcal, gotta love Mexico…) This was not a place you would be able to visit on your own, completely tucked away in the mountains. A few people from our group crossed the little creek and went exploring up the opposite mountainside, turning into pin sized dots tucking in and out of the plants. We sipped mezcal in the vinata waiting for the donkeys to come down the path with just harvested cenizo. They trotted down the mountain, crossing the trickling water and rocks, up to the vinata to unload before we headed off to have lunch by a lake where the band hooked up to car batteries to power their speakers. We also visited an urban distillery, Bosscal, where no agave cooking happens, but they do have a decorative horno amid their fermentation tanks and stills. The hip space was set up for multipurpose use, with a hall and gazebo; you can just tell the parties there are incredible. The vinatero, Alan Hernandez, was kind enough to share a taste of his CBD mezcal, which definitely seemed to heighten our brunch experience. The contemporary and design forward brand makes a few expressions from cenizo, including a pechuga de conejo, and a damiana (local medicinal herb) infused version. The rest of our trip we spent exploring with Lagrimas De Dolores. The first property we visited was the restored and conserved Hacienda Dolores. The well preserved sprawling grounds punctuated with massive crystals and rock formations are home to the modern distillery, headed up by master vinatera Fabiola Avila. She was working on a special experimental run of pechuga using Dark Matter coffee, and we were lucky enough to taste the puntas from the production. We also got to sample some of her earliest sotol experiments along with their featured cenizo while snacking on local cheese and bread. 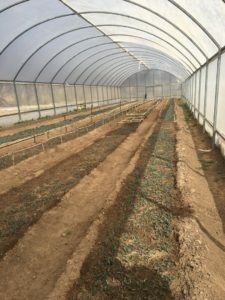 While the Hacienda has a little garden planted with different agave varieties, to get a real understanding of where the flagship Lagrimas De Dolores agaves come from we headed to Rancho La Campana in Mezquital, which doubles as a nature preserve about the size of Manhattan. Touring the ranch we saw first hand the biodiversity and hybridization of cenizo, as well as some other as yet unidentifiable agaves. The brand sources agave from independent growers as well as mezcal from independant vinatas, one of which we were able to visit in the remote mountain town of Temoaya. With no electricity at the vinata, everything is still hand crushed, though they hope to install a solar panel powered crusher that will ease the workload. This is where their entry level Cenizo Colonial mezcal is made, as well as some very tasty (not yet exported) sotol. Luckily for us there was cooked sotol at the vinata that we got to taste, which was very artichoke-like. 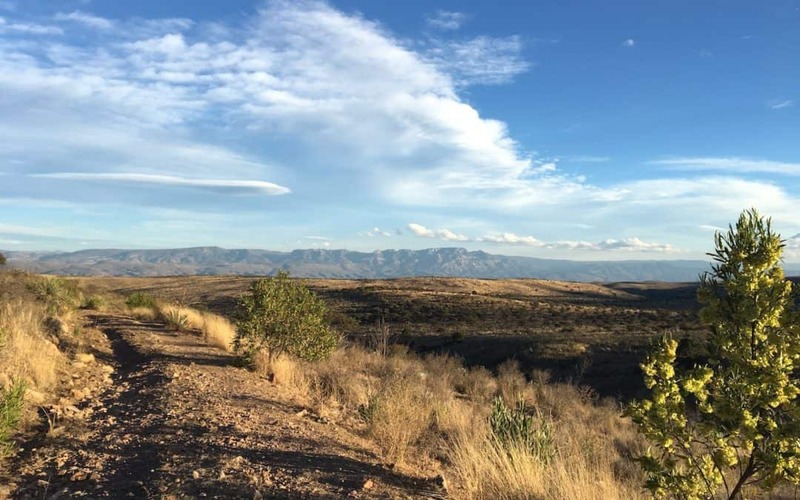 The rustic operation showed a completely different face of Durango, and in the case of Lagrimas De Dolores, a wide variety of terroir influences, both natural and human. The trip as a whole was successful in giving us a glimpse of the wide range of Durango mezcal, rather than just one side of the story. 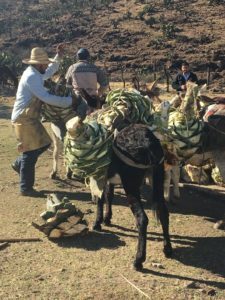 From impressive mansions and private villas to a town with a few hundred inhabitants who all share one phone, and plenty in between, we got to see, taste, and interact with the landscapes, agaves, and teams behind the spirits. I give a lot of credit to the members of Espiritus De Durango for working together to offer a realistic picture. As someone who strongly prefers to go mezcal exploring independently, this was one of the most rewarding organized group trips. With another trade trip on the horizon, and the tourism development, Durango could easily become the next hot spot destination for exploring mezcal. Hello Tess, this was a great article. I was very lucky to be a part of your time in Durango. Being able to show the group the vinata where our Sacro Imperio Mezcal is made and then tagging along with the group at some of the other vinatas made this an extremely memorable and educational experience. I am stoked to hear that our Verde mezcal was such a hit. We took your group’s feedback in bumping up our Cenizo mezcal to 48% prior to exportation and our focus on bringing the Verde mezcal to the USA as soon as possible. It’s so new, we are awaiting CRM certification and hopefully, in a few months, it will available in the US. Wonderful article. Thank you for this dispatch from Durango.